Officials at the new parts centre. Doosan Construction Equipment has opened a new Parts Distribution Centre (PDC) for Bobcat and Doosan Portable Power products in Dubai. The new PDC is a collaboration with Agility, a leading global logistics provider, which is hosting and managing the new facility located in Jebel Ali Free Zone. The new Dubai PDC will provide parts support for dealers and customers of Bobcat and Doosan Portable Power products in the Middle East and Africa (MEA) region. In combination with the existing Doosan PDC at Puurs in Belgium, the company will now be able to deliver parts to more than 90 per cent of the region within 24 hours. 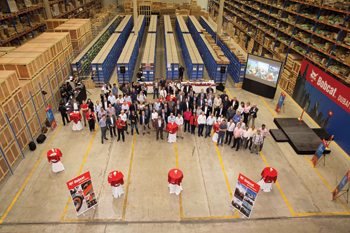 Gaby Rhayem, regional director in Middle East and North Africa, said at the PDC’s inauguration: “With the opening of the new Dubai PDC, we will be able to provide a much better parts service for our dealers and customers throughout the MEA region. “As well as enhancing our aftermarket service, the new PDC demonstrates our strong commitment to the MEA market,” he added. The storage space for Bobcat and Doosan Portable Power parts covers an area of 1,540 sq m in the Agility warehouse, stored in 3,500 separate parts locations.